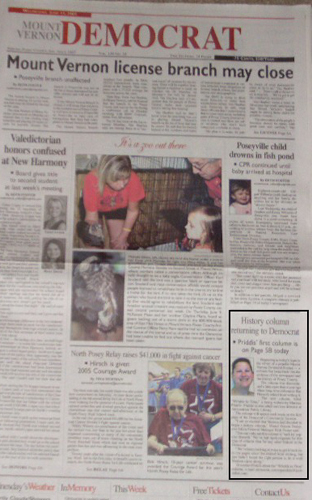 I was recently hired by the local newspaper to act as a story correspondent, and also as a weekly featured columnist! Yay! About a year and a half ago, the lady who wrote the "what was happening in town 50, 75, 100 years ago" column retired, and the paper has been inundated with requests for the column ever since. Beth, the editor, asked me if I would be interested, and naturally I jumped at the chance. "I am so excited that Marissa had decided to begin a history column...We've been looking at ways to get back it back into our pages...but just hadn't found the right person to do it until Marissa came along." Yes, the picture is heinous, but I'll live through it. 4 Comments scribbled by Marissa on 9:22 PM.